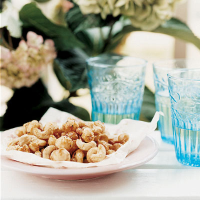 These spicy glazed nuts are incredibly easy to make and are the perfect accompaniment to pre-dinner drinks. Preheat the oven to 190°C, gas mark 5. In a medium frying pan, melt the butter with the honey, Cajun seasoning and half a teaspoon of salt. Add the nuts and stir until coated in the spice mixture. Pour the nuts onto a baking sheet, spreading them out in a single layer. Roast in the oven for about 10 minutes, stirring halfway through the cooking time, until golden. Remove the sheet from the oven and tip the nuts onto a piece of baking parchment, keeping them in a single layer. Leave to cool, then break up the nuts to separate. Store in an airtight container until ready to eat. These nuts are best eaten on the day they are made. Experiment with different spice mixtures, such as cayenne pepper with ground cinnamon, salt and freshly ground black pepper.